In addition to the Washington, DC record, the Bluefield report is also an all-time December daily record. The Washington National amount exceeded the normal monthly precipitation of 3.05" for December. 9 PM Update: Washington National has now had just under 1" of additional rainfall since 4 pm, bringing the total to 2.91". This is now unofficially the wettest December day since precipitation records began in 1871, exceeding the old record of 2.81" on December 18, 1977. Note: The Baltimore record was easily exceeded by the 0.54" which fell in the next 3 hours. Following summer's spectacular pace of over 11 daily heat records for every cold record in the U.S., the ratio for meteorological autumn (September-November) declined to 1.8 to 1. While November's ratio of 1.7 to 1 was well below the August peak of 22.2 to 1, it was the 11th consecutive month in which heat records exceeded cold records. 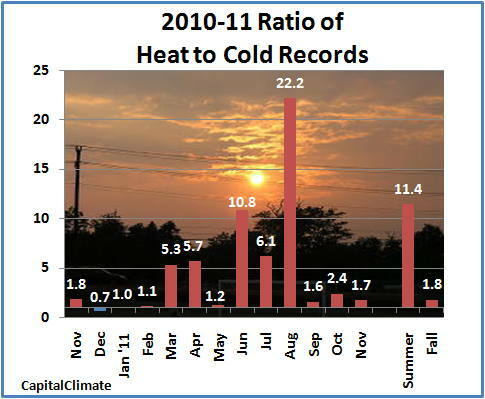 December 2010 was the only month since February of last year in which cold records outnumbered record highs. For the year 2011 to date, the cumulative ratio is 2.9 to 1, vs. 2.3 to 1 for 2010. Preliminary NOAA/NCEP data show that fall temperatures averaged above the new 1981-2010 base period over much of the U.S., particularly along the northern border and into Canada. Temperatures averaged at least 2°C above normal across the northern Plains and northern New England. The only significant area of below average temperatures was in parts of the Southeast, including Georgia, Alabama, southern Mississippi, southern South Carolina, and northern Florida. More details on November's temperatures should be available later this week when the National Climatic Data Center issues its State of the Climate National Overview. 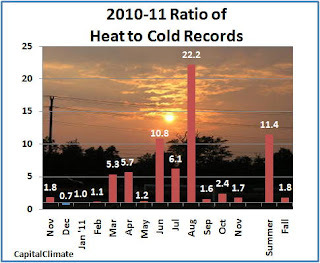 - Monthly ratio of daily high temperature to low temperature records set in the U.S. for November 2010 through November 2011 and seasonal ratio for summer and fall 2011, data from NOAA National Climatic Data Center, background image © Kevin Ambrose (www.weatherbook.com). Includes historical daily observations archived in NCDC's Cooperative Summary of the Day data set and preliminary reports from Cooperative Observers and First Order National Weather Service stations. All stations have a Period of Record of at least 30 years.